I think as we get older we enjoy our desserts more and more or is it just me craving sweet things? Judging by the reaction of friends and family to my latest desserts I am not alone. I love desserts made with coffee. Of course they are not to everyone's liking. Having been told a coffee flavoured cheesecake would not work I was determined to give it a go and this recipe is what I came up with. Those who tried it admitted it was excellent. It scores 10 out of 10 for taste and zero for presentation but . . . it has a wonderful rich taste. Very much a dinner party dessert where you want to impress. What is more it is simple to make and involves no cooking nor any great culinary skills. This recipe is for a specific flavour but you can let your imagination go and make a variety of different flavours using other fruit or flavourings. Just make sure you do not have a lot of juice with the fruit otherwise everything is just going to end up soggy. Place biscuits in a large polythene bag and crush until they are reduced a fine powdery crumb. Melt the butter. Place the biscuit crumb and demerara in a bowl and mix together. Add the melted butter and mix until evenly incorporated. Cut out baking paper to cover base of spring-form cake tin. Line sides with cling film before putting base in place so the base covers the sides and goes under the base. Carefully add the biscuit mix to the cake tin and smooth out with a large flat spoon (or similar), pressing down so as to compact the mix equally across the base. Place the cake tin in the fridge and leave to set for about 2 hours.Whip the double cream until it just thickens and stands up. In a large bowl add the cream cheese, icing sugar, vanilla extract and coffee and then whisk together. Fold in the double cream with a spatula until well blended. 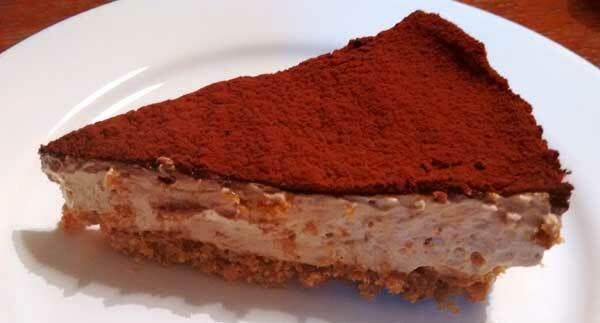 Spoon the cream cheese mixture over the biscuit base and smooth to the edges.Sprinkle the top of the cheesecake with Cocoa powder until completely covered.Put the cheesecake in the fridge for two to three hours until it is set. Then serve and enjoy!